This blog provides topics of Statistical estimations and tutorials of using R and WinBUGS. R is an open-source software package and rapidly increases its popularity in both industry and academics. Google trend is probably the best tool to show you how popular R is since it allows us to rank the search interest among five major statistical software packages. You can clearly observe that R has been the top search interest since 2011 and continues to maintain its top place. Many authors of the following resources inherit this open-source spirit: they are willing to put their contents online and let everyone can learn R for free. 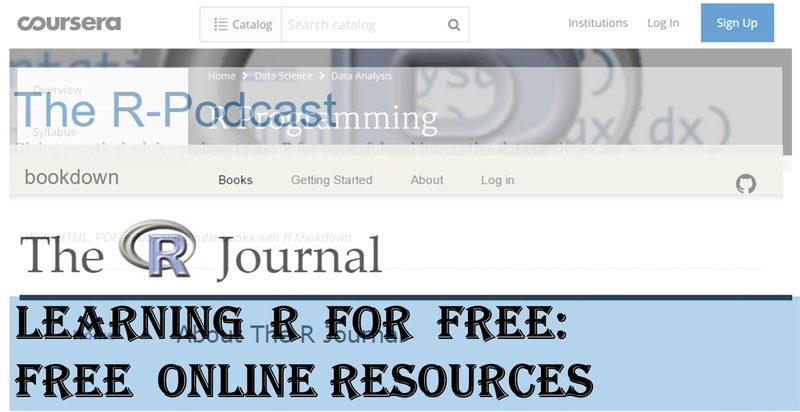 In this post, we collect many free online resources to help you learn R for FREE. Notice that these resources are offered in a different form of format such as videos, books, podcasts, or purely just texts. We classify these resources based on their formats for fitting your learning styles. twotutorials: This website teaches you how to do stuff in R within two minutes or less. bookdown: This is a new website to host lots of R books. You can read them online and some authors even allow you to download the book as a PDF file. How to make a great R reproducible example? The following first three podcasts are talking about the news about R while the others mainly involve the applications (data science, finance, ... ) in R.
This type of learning resources provides some step-by-step procedures to learn R. One trait about them is that these resources are usually offered in the form of texts instead of videos like R courses above. These resources are mainly written by many bloggers. Quick-R: The author created this website for both current R users, and experienced users of other statistical packages (e.g., SAS, SPSS, Stata) who would like to transition to R. The author also provided a lot of tables and figures to help you learn R (mainly functions) step by step. Page last updated on 14 Dec. 2016. Like This Post? Please share or leave your comments below! © 2014 Blog of Statistical Estimation. All Rights Reserved. This website disclaims all responsibility for errors or omissions, including without limitation responsibility for damages resulting from the use of or reliance on our website. Use of the information and instructions contained in this website is at your own risk. This website is designed and maintained by Liang C. Zhang . This website uses a template modified from Blogtipsntricks.